Napolitaine are typical cakes from Mauritius, they are found everywhere even in hypermarkets now. 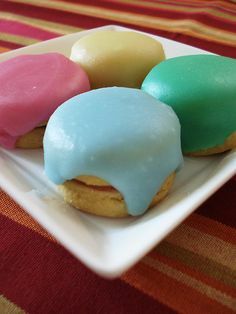 The Neapolitans are two shortbread biscuits stuck together with jam and then covered with a glaze mostly pink (they are also found with a white glaze). Addicted to the Napolitaine? Do not hesitate to bring back home some and why not experiment the recipe by yourself at home. There is a small pastry shop in the neighborhood of Port Louis(near the church of Père Laval in Sainte Croix) where they are great and at a bargain price. The seller is also very friendly, if you go by there, do not hesitate to visit him. A typical and popular dessert among Mauritians, the vermicelli is a bliss for the taste buds! Usually prepared with milk, grapes and cardamom, vermicelli is an excellent dessert, which is often found on street corners, ideal for children and adults alike. Some prefers it hot, others cold and some likes the liquid version and others might prefer the pudding version – up to you to taste them all and make your choice. This sorbet has gone through the generations… the Vona Corona ice cream has been founded some 90 years back and is a purely Mauritian Sorbet. In all these years, the taste has never changed and everyone is still fond of it. Without too much sugar, it is perfectly balanced, so that each fragrance is distinguished. This dessert has nothing comparable to industrial ice cream and definitely brings a real touch of freshness and authenticity. Exotic fruits salads can also be excellent desserts. In Mauritius, it is often found on street corners and you can also find the fruits in crystallized format. On the other hand, we have a wide selection of exotic fruits on our small tropical island that can serve as desserts, such as carambola, grenadine, jaque, longan, soursop, coconut, pineapple, mango, Papaya, watermelon, banana zinzeli, letchi, dragon fruit, tamarind among others. Exquisitely fondant, the flan is a lovely dessert that is so easy to prepare – you won’t believe it. 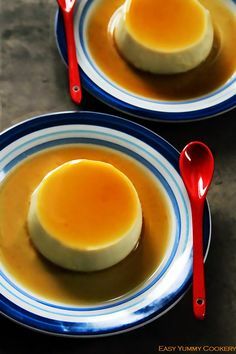 Prepared with milk, egg and coconut, the flan can be served with caramel or with maple syrup. This delicious dessert will leave you wanting more after each mouthful. With a pleasant flavor, corn pudding – popularly known as “Poudine Mai” – is just a fun dessert – with the various textures that explode in your mouth as you enjoy it. Perfumed with vanilla and coconut, the corn pudding is prepared easily and quickly. Served cold or hot – solid or liquid – well it is always a pure bliss in the mouth. A traditional recipe from our small island, macatia coco is a sweetness appreciated by many Mauritians. The name macatia would come from Swahili and would mean “bread”. This term would have designated the bread of slaves. At the base, the macatia was prepared with the remains of bread the day before, and sugar was added to remove the bitterness. Here in Mauritius, we love to consume this small sweet bread with a cup of tea or hot coffee at the time of the snack. To make it even better – spread some butter on the sugar and coconut inside – Miam! Undoubtedly, ladoo is a dessert originating from the Indian culture, adopted by the Mauritians. Traditionally served during religious ceremonies or for Divali festival, the ladoo is also found in sachets in supermarkets, in the small shop of the village or in various food courts across the island, accessible to all, as a dessert or Snack, at any time of the day. 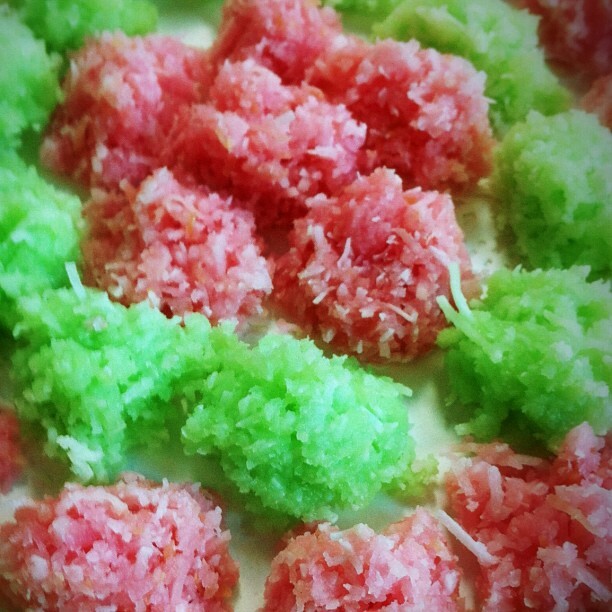 Coconut candy is a delicacy based on milk, grated coconut and sugar. This is something that can be easily reproduced at home and is not complicated to do. Very sweet, this delicacy will make the happiness of the coconut followers and also of the little ones – since they are available in different colours and flavours! Who can resist succumbing to this refreshing drink. These are milk-based drinks and Indian basil seeds (called “toukmaria” in Mauritius: these are small black seeds that, immersed in water, they swell and coat with a white cottony substance) Which are consumed very cold or in an ice-cold version. Vanilla and strawberry Aloudas are sold by glass. Must try if you go to Mauritius! A short paste, a creamy cream and grated coconut. According to the shops, the cream is more or less heavy which can make the Puit D’Amour a bit disgusting yet the one at the Port Louis market near the Aloudas stand remains just perfect! Go and have a try! There are of course many other Mauritian deserts that deserve the detour but mentioning them all would have been difficult. I hope this article will give you a little insight into the Mauritian delicacies cuisine and will make you want to taste it.